Our pay-by-the-hour in-home care service is a wonderful way to care for your loved one as it offers great flexibility to suit your loved one’s changing needs. Do you need inhome care assistance to care for your loved one through the day while you are at work, or to give you a break? Do you or your loved one need an in home care service in the morning to assist with toileting, showering and dressing or to ensure your loved one enjoys a healthy breakfast and takes their medication? Do you need in home care during lunchtime? Our carers can shop for food, cook a hot homemade, main meal for the day, offer medication reminders or assistance to go for a walk? 9. Visit your loved ones in a nursing home and provide companionship, and assistance with feeding. 10. Our carers are happy to take your loved one out of the nursing home to enjoy walks within nature landscapes so they feel alive and part of humanity. Hourly in home private carers provide assistance for short periods of time throughout the day. 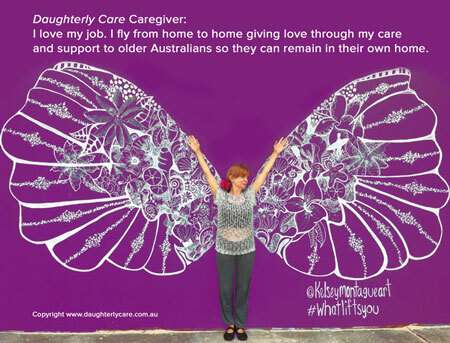 By providing a range of home care services, Daughterly Care supports our elderly clients and their families so they can enjoy their life at home and in their community. Our pay by the hour in home care service has a minimum of two hours for each booking. Daughterly Care is flexible and can provide a wide range of re-enabling or enabling support and private care during that time. Pay by the hour care is available on Sydney’s North Shore and Northern Beaches. If you or your elder’s care needs are more intense or complex, you may need around the clock care. Our Live in Care or 24 Hour care service is a wonderfully suited service, providing the elder with assistance when they need. At Daughterly Care, we are extremely proud of the quality of service and care our in-home carers provide. Each private carer has an excellent command of the English language, they are thoroughly trained in caring for older people and are Australian or a permanent resident. They are also reference and police checked, and go through our very stringent employment criteria. Need more information? To know more about us, read why we started Daughterly Care, and take a look at our services. Meet our in home carers and case managers and operations team.